I finally took the plunge and got me some dermal fillers for my nose. For the past 13 years (at least), I’ve been conscious about the way my nose looked and only took pictures from the front. I’ve had people tell me how flat my face – and nose – was but actually, it didn’t make me sad or anything. Well, now that I think of it, I’ve never been sad about the way my nose looked. Just really conscious of it. On and off over the years, I thought about getting something done to it but never had the courage nor money to. Then came along Street Directory and Aesthetic Works and I was sponsored a nose filler treatment. It took me quite a bit of stressing over to decide if I really wanted this. I mean, I would never know how my nose would turn out. What if I hate it after the treatment? I’ve seen other girls who have had fillers and/or plastic surgery done to their noses and the results looked terrible (but somehow they still seemed to love it). What if I can’t accept the way I look afterwards? What if the customs officer in France decides I don’t look like my passport photo enough and doesn’t let me through a couple of weeks later? What if I look so different, I can’t even recognise myself? I’ve kind of accepted me not liking my nose; Will I accept my new nose? What will other people say? But then, it is still a sponsored treatment after all, and besides, it’s only temporary. Nose fillers last only for months so if I don’t like the way it turns out, I’ll go back to how I looked like originally. And really? At this age, do I really want to care about what other people say about me? I know my mum and boyfriend would never like the idea of changing my face, but it’s still my face and I’m mature enough to make appropriate decisions for myself. Hey, by the way, these are all legit things you have to think about before doing things like fillers, no matter how old you are. Consultation with Dr. Sim Kwang Chuor. Dr. Sim was very happy to see me and the first thing he said when he saw my nose up close was, “You’re the perfect candidate for nose fillers!” And his kind laughter made me smile too because it seemed, at that point, like he was going to make a real difference. In the picture above, he was pointing out how high he would make my bridge go. He told me that the fillers he would be using was Radiesse and he said it would last me 15 months. He was very professional and never said anything that made me feel bad about myself, which I feel is important in a doctor of any kind. I recall this one time when I had to go for a medical checkup and this particular doctor, after analysing my x-ray, started asking me questions like whether I had any lung infection and whether I bought any insurance, and then proceeded to refer me to a lung specialist because she thought I had tuberculosis and was also rude about it. Oh, the plain horror of thinking my life was ending as I waited for half an hour, watching patients with TB pass me by. But, I’m digressing. The thing about doctors is that they’re like scientists. When they see something that they can work on, like a new project for scientists, they try to achieve the ideal results. Dr. Sim suggested some other things I could do, like lip and chin fillers (I heard those hurt) and Alexis said something about a golden ratio. As someone with a background in science, I knew this was all very, well, scientific. Like how a chemist would describe the perfect experimental setup for a titration experiment. And besides, I know in my heart that the only thing I’ll ever do to myself is something about my nose. And maybe a caesarean. After the consultation, where my nose was described to me and where Dr. Sim told me what he was going to do and what I should expect, I went into another room and a nurse applied some numbing cream on my nose after cleaning it with alcohol. Me looking spaced out, thinking about life (LOL), while the nurse prepared the numbing cream. I managed a weak smile after the numbing cream was applied. To be very honest, I was extremely nervous to the point of being jelly. It was a good thing I was laying down. I only noticed the picture hanging on the wall in that room when I uploaded it here. The whole time I was waiting for the numbing cream to take effect (20 minutes), all I could do was talk and talk and talk, as thoughts rushed through my brain. It’s not too late to back out now! What if my nose becomes distorted?! What if I get an allergic reaction (some people do get allergies from fillers)? And again, what if I can’t get into France? Oh my god! I’m freaking out! Every 5 minutes, I would say, “I can still feel the sticker (that was placed over the numbing cream on my nose)!” And the ultimate, “I wanna be put under G.A. (general anaesthesia)!” To that, Alexis calmly replied, “You’re so drama.” Actually, if I were her, I would have liked me to be put under G.A. too. After about half an hour, the numbing cream was cleaned off and I went into another room, where the tip of my nose was iced and the real work began. Putting ice to further numb the tip of my nose, where the injection would be. I’ll spare you the gross pictures – I have a lot – taken during the process but I’ll describe it to you. Only one injection was made. The first time the needle pierced through my skin, I felt it. I could also feel the fillers going up my nose and Dr. Sim kneading away. It didn’t hurt, I could just feel it. There was one part where it did hurt though, and it was when the fillers were placed at the tip of my nose, I think. But if I were to rate it on a scale of 1 to 10, assuming 10 to be the pain of giving birth, I’d say it was a 3. There was a little bit of blood, but nothing unlike when you fall and get a cut. When it was done, someone handed me a mirror and I was asked to look at myself. I squealed, “I don’t dare!” To which everyone – nurse, doctor and BFF – said, “Seeeee!” The story of my life. “Before” on the top, and “After” at the bottom. Was caught mid-sentence in the second picture, but it’s the best I got. Dinner with Alexis at Ichiban Boshi, about 20 minutes after the procedure. My nose is swollen and my eyes look pulled closer together. 72 hours after the procedure. My nose looks smaller, less swollen and more normal here. The inter-canthus distance has also increased. Picture taken with my Macbook Air. Funnily, nobody has seemed to notice my new nose, which is a relief because this means I look normal. Initially, I did consult my boyfriend about getting fillers and he wasn’t too pleased about it. But being the really awesome guy that he is, he said, “Well, it’s your nose. Your call.” Tell me I have the best boyfriend in the world! I do like my nose currently (hooray to a 3D face), and I’m not sure if I’d like more fillers, which is what doctors normally do during the first review session after the procedure. The picture of myself at Ichiban Boshi scares me a little bit. Ça me fait un peu peur. But I will have my review at Aesthetic Works the coming Thursday and then I’ll update you all again on this blog. So far, I haven’t felt any pain ever since the procedure and the pressure on the nose (as if someone was pressing down on it non-stop) I felt in the first two days have since gone away. I hope this entry has been helpful and informative, especially if you’re looking up about dermal fillers. With the BFF and her awesome hair! Lucky girl doesn’t need fillers! 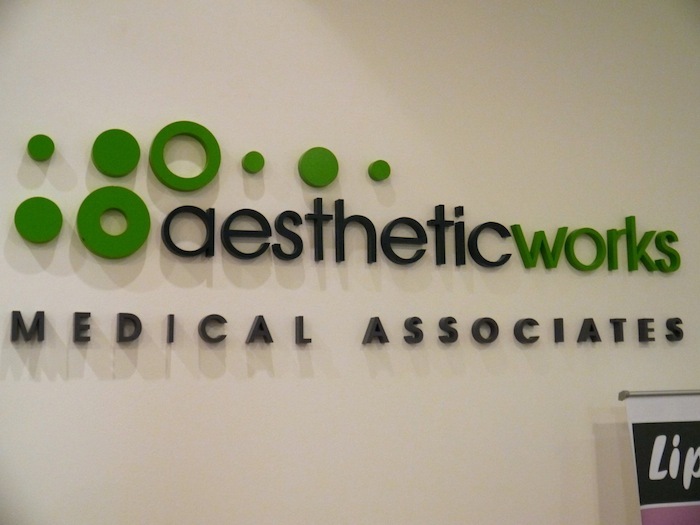 Aesthetic Works is located at 80 Marine Parade Road, #05-06/07 Parkway Parade, Singapore 449269. The clinic’s operating hours are Mon – Fri 10:30am – 9pm and Sat 10:30am – 4pm. You can also call them at 6493 3678 for any enquiries or appointments. If you have any questions about nose fillers, you can write them in the comments section or write me an email at contact@lacedivory.com and I’ll try to reply as soon as I can! Est-ce que tu aimes mon nouveau nez? Bride at the door, via 100layercake. P.S. Pardon my French. I’m leaving in a week and I am very stressed over how much I have forgotten. Dermal Fillers – I Did it (Plus Pictures of Before & After) was last modified: December 2nd, 2012 by Roxanne C.